Get your Virginia insurance license using an America’s Professor online training course. Our comprehensive video lectures, review questions and study guide will help you learn, and retain, the material needed to pass your Virginia insurance license exam the first time! Surety Bail Bondsman are required to obtain a Property and Casualty license. This is my second time utilizing your wonderful course!!! I aced the exam on my first try. Thank you, America's Professor, for providing multiple ways of discussing confusing content in a way that is not only easy to understand, but entertaining as well. Would highly recommend to anyone wanting to become an insurance agent. Great, Professor Mr. Jack is awesome. His teaching is wonderful. Although the course is very hard but his guidance to study technique and way he drives students make it easy. I have completed this course before 18 days of duration. I have passed it in a first take. I can fully recommend all interested to sign and take the course. Thank you Mr. JACK. and thank you AMERICA'S PROFESSOR .COM. I highly recommend this program because if you're an auditory learner, the videos are especially helpful. If you're more of a visual learner, you have the text, broken down into helpful sections. And anyone can benefit from the practice questions. I passed this the first time, along with the P&C and Life and Annuities exams, previously. I have been in the insurance industry for over 10 years. English is my 2nd language but this course was so easy flowing as if it were in my native language. Due to medical issues my license expired. Was referred to take Americas Professor. It is the best course of any kind I have ever taken. It is so easy and simple to understand. Unbelievable. I passed the stated exam within 30 minutes easy. ABSOLUTELY THE BEST COURSE THERE IS. WILL ONLY SUGGEST AMERICA'S PROFESSOR TO ALL OF MY BUDDIES. Special thanks to Jack for explaining not only theoretically but by providing real examples. The best way to memorize. TOP RATINGS! ! ! I can't say Thank You enough to America's Professor!! I am a 46 year old woman who's husband unexpectedly had serious health problems, and who had to somehow find a way to support the household. I was nervous about going back into the workforce, and very nervous about my ability to pass the exam to become a licensed Producer. American Professor to the rescue! Professor Morton explained everything SO well, that I actually understood the information and really didn't have to memorize much at all. I also laughed out loud at some of his examples and remarks, which kept me entertained and interested. I passed on my first try! Listen to him! Follow his advice! Try not to worry! You WILL pass! Now I am in a position to be able to care for my husband and keep our household running on my own! It's such a relief after such a horrible year, and one of the only good things to have happened. I couldn't have done it without Americas Professor and its wonderful staff. Thank You all SO MUCH!!!! it's a great course. Teacher Morton is incredible. I love his way of teaching. Though it was online class I felt live. He is a bank of knowledge. I was able to pass in a single take. When I was in the testing center I felt the questions are very familiar. I love it. I started with another course from another company and was having a hard time getting through the chapters without falling asleep. I am so glad I found America's Professor. Jack made it so easy and much more interesting. I took my VA Licensing exam today and passed first time. Thank You Jack! This is the second time I've used America's Professor and I could not be happier. I passed both Life and Annuities and Property and Casualty on the first try. The lessons are broken up into different sections and it really is an easy program to complete and recall the necessary information. I didn't take any notes. I watched the videos and took the exams at the end of each lesson. I felt very confident going into the exam and while taking the exam. It would be very hard to fail the exam if you watch the videos and take the practice exams. Thank you so much for helping me pass the exam. The funny jokes, comments, analogies, and real life examples made it really easy to recall the information. Also, the staff is great. I emailed questions and always got a response the same day or next day. I would recommend America's Professor to anyone. Great exam preparation course. Passed the course easily. I have to say, Jack is the man. I was told I needed my VA LH&A ASAP for work. I went on and purchased this course the next day once I found it. Started it Tuesday, and took it the following Monday morning. Passed the First time and studied in the evenings after work. Its a lot of information but just listen to what Jack is saying, follow along, and make sure you do the practice test/quizzes. I reviewed the morning of by glancing over some key points, and can't say I felt wonderful about it. Once I got in there, the info just came flowing back from somewhere. Very pleased with the course. This was my first time taking an online course, it was the most helpful, reliable and informative course. I felt as if i had a personal relationship with my instructor (Jack). I completed the course was allowed a free extension and was able to call and be assisting with any question i had i took my test and passed the first time. I recommend this course to anyone. Please also check our frequently asked questions about the Virginia Insurance Licensing Exam. Knowledge is the key to passing your insurance exam, and you’re in good hands with America’s Professor. We have decades of experience teaching students just like you. Our comprehensive courses are designed to be engaging, interesting, and informative to help you retain the information. Whether you want to sell life and annuities insurance or your goal is to become a licensed property & casualty insurance agent, America’s Professor can help. There are no shortcuts to learning the information—no CliffsNotes or quick-study guides. Knowing the information inside and out and reviewing the materials up until the day of your insurance exam is the best way to ensure you pass with flying colors. Prepare: Enrolling in a quality pre-licensing course is your first step once you’ve decided which license you want to obtain. America’s Professor offers comprehensive courses that provide you with everything you’ll need to know to pass your exam. Pass: The next step is passing your state licensing exam. Each state has its own licensing requirements, and you must obtain a resident producer license in the state of Virginia in order to sell policies or even discuss insurance transactions. Apply: Once you pass your insurance exam with a score of 70 or better you can formally apply for your insurance license and begin working! Virginia offers several different exams, including: life, annuities & health, property & casualty, personal lines, title insurance, and public adjusters. You will need a score of 70 to pass, but note that each exam consists of two parts: a general knowledge section, and a state-specific section. You will need a score of 70 or greater on each section—the two scores are not averaged. For more information about the number of questions on the exams and locations where you can take the test, click here. Registration: You must register for the exam by calling Pearson VUE (the testing company) at 1-888-204-6272; it’s a good idea to call at least 3 days in advance of the date you plan to take the exam to ensure you secure a spot. 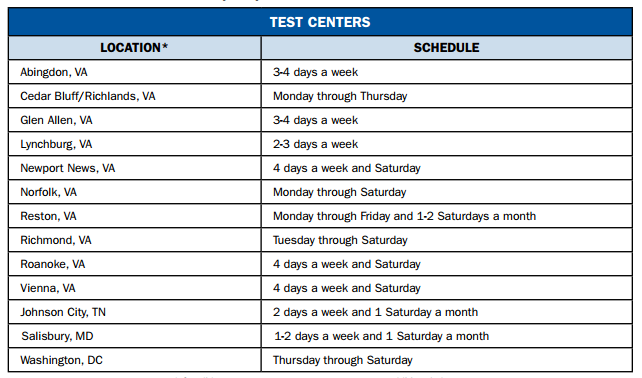 Testing Centers: There are several test centers throughout the state of Virginia and neighboring states where you can take your exam. Find a test center near you on this page. Licensing Fees: The licensing exam fee is $51; you may take up to two exams for that fee. If you need to retake any portion of the exam, the fee is the same (an additional $51). Once you’ve passed your exam you must apply for your license. All license types have a non-refundable application fee of $15, except for the public adjuster license, which has a fee of $250. You can submit your application request either through NIPR (National Insurance Producer Registry) or Vertafore (formerly Sircon). Fingerprinting: There is no fingerprinting requirement, however, the licensing application will ask several background check questions. Should you answer “yes” to any of those questions, a more in-depth process will be required.